Wondering where to get a black Sony Ericsson Xperia X8 in the UK? Well T-Mobile UK have opened a pre-order page for the handset and claims that the black colour is exclusive to them in the UK. The phone will start shipping in January along with a free Cardio Trainer app and arm band. Price plans are unknown right now, but if you’re interested, you can register for updates here. Update: Looks like T-Mobile does not have an exclusive. 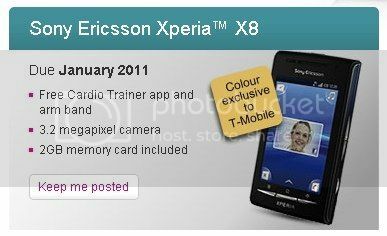 Three.co.uk is also selling the black Xperia X8 on PAYG. i have this Phone and Trust me..don’t buy this phone, you’ll regret later..
And after SE have said there will be no update to 2.2 for the X10 family as well as the X8 who in their right mind would want it? It won’t be long before they’ll be giving away a SE phone with every bag of crisps you buy. Previous post: New firmware update (2.1.A.0.390) to bring dual-touch support?